Take a minute to cringe as you recall your worst stories about negotiating your salary: The time you found out a colleague with equal experience received significantly more than you did. The time your supervisor told you a raise simply wasn’t in the budget. Or the time you accepted an offer only to realize you could have negotiated myriad benefits, too. Now, think of your best story – the time when it all went as planned. What? You don’t have one of those? That can be the case for far too many women, says coach and consultant Tara Lynn Foster. Foster has a few of her own salary negotiation horror stories to share, which she did during her “Negotiate Like a Boss” seminar for women, a collaboration of Wake Forest University School of Business, the American Association of University Women, and Ellevate, a professional women’s networking group. It was held at the WFU Charlotte Center on January 31. According to the U.S. Census Bureau’s American Community Survey, full-time working women were paid 80 percent of what men were paid in 2015. When you break it down by race and ethnicity, white women made 75 percent, African-American women made 62 percent, and Hispanic or Latina women made 54 percent. 59 percent of millennials didn’t negotiate for any of their compensation in their current job, and 79 percent didn’t negotiate offers for their first job out of school, according to a Levo League study. Why? Probably because they didn’t know how. 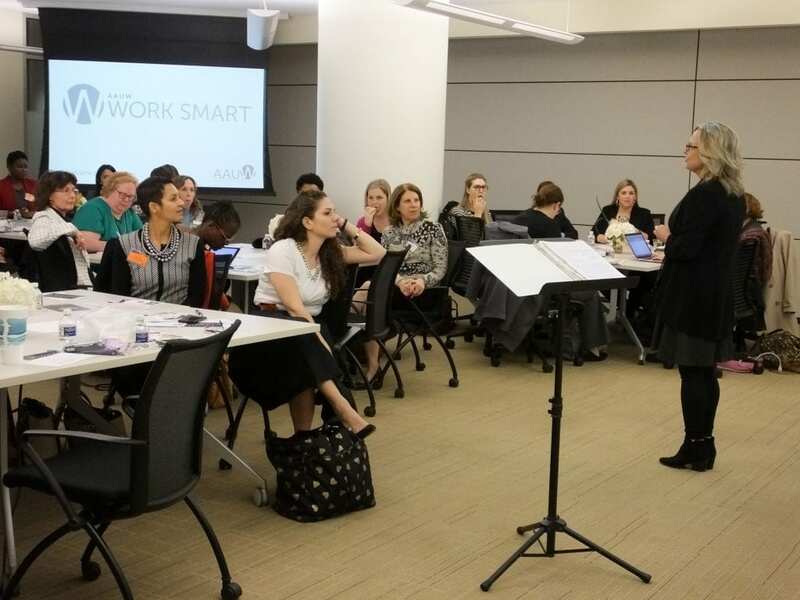 As a certified trainer for the AAUW Work Smart seminar, she’s an expert now. And she says it all comes down to preparation. Know your value, and watch the rest fall into place. “The first thing we need to do is talk about why we are hesitant to negotiate,” Foster said. And the roughly 40 women in the seminar offered plenty of reasons for that anxiety: It will backfire. I don’t know what’s fair. They’ll say no. I won’t ask with authority. I’ll be perceived as difficult or aggressive. So sit down and figure out who you are, what you’ve done and what you will contribute to the company. Know what you want and why you want it. And, here’s the deal: Once a company makes an offer, or even sits down for a performance review, they’ve invested in you. They want you to work for them. You have more negotiating power than you realize, and several human resources specialists in the seminar reinforced that idea. Frame your ask in three parts: Good, better and bye-bye. There’s more to determining your desired salary than plugging a job description and location into salary.com, though Foster recommends that tool. You should identify your target salary or the amount that reflects your worth based on market data. Then you set your bolstering range – or the amount you use to negotiate with your employer. And then, using your budget, identify your resistance point – the salary at which you walk away from the offer. That’s the biggest takeaway for Carolyn Malloy (Saturday MBA ’18), a recruiter with Allegis Global Solutions in Charlotte. She’ll always have ready her salary number, supported by research, for any future negotiation. “Knowing the market data empowers you to be confident in that number,” she said. Keep in mind benefits – signing bonus, car allowance, tuition reimbursement, health insurance, paid vacation and the like – can be negotiated, too. Don’t focus only on take-home pay. Make them say a number first, and other negotiating strategies. Deflect questions about your current salary or your desired salary; you want them to offer, so you can negotiate from there. If you’re negotiating a raise in your current job, know the review and budget cycles. If the salary budget is determined in June, you should start talking to your boss before that. In either case, use what Foster calls “The Power Pause” – wait before reacting to something you hear because it might lead to an unexpected and welcomed change in the offer. And if you don’t get what you wanted in this negotiation, take what you learned to help with your next one. It’s still a win if you learn something. Career coaches at the School of Business routinely cover salary and other negotiating strategies for students in the undergraduate and graduate business programs. It’s part of the preparation taught in and outside the classroom before graduation. Inviting the business community to learn these important workplace skills demonstrates the School’s commitment to sharing expertise and the value of lifelong learning. Alicia Roberts is a freelance writer, editor, and communicator, based in Charlotte, N.C.